David Fewchuk, Chairman of Aurora Vehicle Association, a great solar car racer who enlightened the solar car all over the world, pioneering researcher of solar car history, died of a heart attack on 22 Sep 2010 in China that was the destination of his visit. 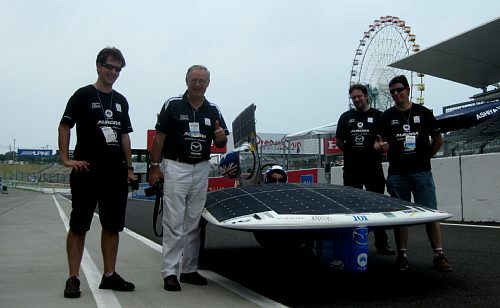 He was our friend and a compiler of the history of the solar car. We had been exchanging him for information on the solar car history. We were looking forward to the completion of his work. He was very energetic and very active in this solar car race Suzuka. We were hoping to meet him again in Darwin. However, these wishes have become never achieved. We feel deep sadness. He planted the seeds of the solar car all over the world. We should watch the bud and the growth of the seeds that he planted. And, we wish the bud to grow up greatly.